Bitter tastant (emetic) research utilises a variety of animal models for the identification of the emetic susceptibility of novel compounds and aim to characterise the underlining mechanisms that give rise to emesis. There are two categories of animals used in this type of research, those that have the ability to vomit (ferrets, dogs and cats), and those that lack the emetic reflex (rats and mice) (Holmes et al., 2009). In addition to this, there is a different sensitivity to emetic compounds amongst these animal models, due to the existence of multiple pathways for the emesis induction. There are also differences in the receptor pharmacology and distribution, and metabolic pathway regulation. This makes it very hard to use a unique animal model for emetic research, pushing research towards a multi-model approach, therefore increasing the utilisation of animals (Robery et al., 2011). Ingestion of bitter tastants can lead to innate aversive behaviour, reduced gastric emptying, nausea and vomiting in mammals and as such bitter tastants are thought to provide a potentially vital warning sign of toxicity (Robery et al., 2011). Humans recognise thousands of different compounds as bitter. Despite this ability only around 25 taste 2 receptors (TAS2R) have been identified. Common bitter ligands include cycloheximide, denatonium, PROP (6-n-propyl-2-thiouracil), PTU (phenylthiourea), and β-glucopyranosides (Meyerhof et al., 2010). As previously stated, bitter substances are detected by a specific subset of taste receptors, known as BITTER TASTE-SENSING TYPE 2 receptors (TAS2Rs) (Meyerhof et al., 2010). These are part of the superfamily of G protein-coupled receptors (GPCRs) and can be found on cell surface that mediate gustatory taste perception on the tongue. Signal transduction of bitter stimuli is accomplished via the α-subunit of gustducin (Gulbransen et al., 2009). This G protein subunit activates a taste phosphodiesterase and decreases cyclic nucleotide levels. The βγ-subunit of gustducin also mediates taste by activating IP3 (inositol triphosphate) and DAG (diglyceride). These second messengers may open gated ion channels or may cause release of internal calcium. Although all TAS2Rs are located in gustducin-containing cells, knockout of gustducin does not completely abolish sensitivity to bitter compounds, suggesting a redundant mechanism for bitter tasting (unsurprising given that a bitter taste generally signals the presence of a toxin). One proposed mechanism for gustducin-independent bitter tasting is via ion channel interaction by specific bitter ligands, similar to the ion channel interaction which occurs in the tasting of sour and salty stimuli (Gulbransen et al., 2009). The properties of TAS2Rs are different from other GPCRs, because of the ability of binding a wide range of compounds with low specificity and affinity. TAS2Rs have recently been suggested to have important extra-oral functions in the respiratory and gastrointestinal tracts. In the human airway epithelium TAS2Rs are expressed on the solitary chemosensory cells and ciliated epithelial cells, where they sense chemical irritation and promote ciliary beat frequency, respectively. Thus TAS2Rs may be protective and part of the defence against inhaled noxious compounds (Zhang et al., 2013). Recent studies have found that in resting primary airway smooth muscle cells, bitter tastant activate TAS2R-dependent signalling pathway that results in an increase in [Ca2+]i levels, although to a level much lower than that caused by bronchoconstrictors (2-adrenoceptor agonist) (Zhang et al., 2013). Under physiological circumstances, bitter tastants can activate TAS2Rs to modestly increase [Ca2+]i levels without affecting contraction, but in the situation of muscle constriction, they can block L-type calcium channels to induce bronchodilation (Zhang et al., 2013). TAS2R agonists showed both greater relaxation and inhibition of airway hyper-responsiveness than a β2-adrenoceptor agonist in mouse airways. Given the large selection of known natural and synthetic agonists recognized by the 25 TAS2Rs, the findings have introduced bitter taste receptors as a potential new family of targets for asthma pharmacotherapy (Zhang et al., 2013). D. Discoideum is a well-established research model organism, especially in investigating chemotaxis. D. Discoideum is a social amoeba that feeds on bacteria as its staple food source. Once the food supply is exhausted, cells start a developmental program leading to the production of spores that are able to survive in hostile conditions (Frey et al., 2007). Starving cells produce a chemo-attractant, cyclic AMP (cAMP), which serves as a signal for 1 x 105 neighbouring cells to aggregate, which then develop into a mature fruiting body (after 24 hours), where 20% of the cells form a stalk that supports a spore head incorporating 80% of the remaining cells as spores. 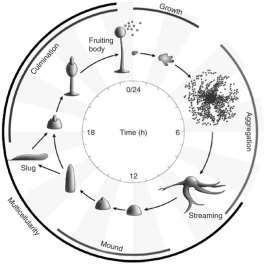 When food sources are available again, the spores germinate into amoebae, completing the life cycle (Figure 1) (Frey et al., 2007). Figure 1 D. Discoideum, develops from a single vegetative amoebae (0hrs) through to the generation of the mature fruiting body (24hrs). Aggregation is caused by the chemotaxis of cells toward cAMP waves to give rise to a multicellular aggregate. Aggregation results in the creation of a mound, then a tipped mound, and as development proceeds, the tip prolongate and forms a finger. Ultimately, the finger collapses to form a slug or continues to form a fruiting body. During final stage of the development, the cells differentiate into vacuolated stalk cells that sustain a spore head containing spores, which can tolerate a wider range of environmental conditions. The full developmental process from starvation of vegetative cells to the formation of a mature fruiting body is accomplished in 24 h (Frey et al. 2007). D. Discodeum has been extensively utilised to investigate a range of fundamental biological processes such as cell migration, signal transduction, phagocytosis and signalling during morphogenesis and cell differentiation. The fully sequenced genome contains 34 Mb of DNA (84-fold smaller than the human genome). D. Discoideum has a genome that encodes for a variety of proteins that are human homologues, associated with a variety of disorders (Boeckeler et al., 2007). Therefore, it has been suggested that the primary role of those proteins can be analysed in the model to understand their related disease function. Nausea and vomiting are common but serious side effects associated with many therapeutic drugs. Whilst the physiological mechanisms behind the generation of the vomiting response are well characterised, the diverse range of emetic stimuli that can generate the response are poorly understood. The potential of using D. Discoideum, a eukaryotic amoeba, as a model for predicting emetic liability was examined in this thesis. The effects of a diverse range of known emetic and aversive compounds on Dictyostelium cell behaviour was investigated, resulting in the identification of a small number that strongly inhibit cell behaviour in a concentration-dependent manner. Recent studies using Dictyostelium as a simple model system for bitter related (emetic) research has shown the validity of using this approach for the reduction of animals in testing for emetic liability. Even though Dictyostelium does not contain genes encoding homologues to T2R proteins associated with bitter compounds detection, it has been identified the molecular mechanism responsible of PTU detection. The screening of mutants resistant to the effects of PTU on growth identified a putative G-protein coupled receptor mutant, GrlJ-. Translation of this discovery to human context identified an uncharacterised human gamma-aminobutyric acid (GABA) type B isoform, with a relatively weak homology to GrlJ. The expression of the human GABA-B receptor restored GrlJ- sensitivity to PTU, implicating this human protein as a novel receptor for PTU. In addition, GrlJ only partially controls PTU detection but not detection for all bitter substances. This research was carried out by monitoring the cell behaviour (motility, circularity, protrusions formation and displacement) following exposure to a range of known emetic compounds. Results show that bitter tastants cause an acute, marked and concentration dependent effect on cell behaviour. Therefore, this suggests that Dictyostelium may guarantee a new model for the analysis and screening of novel bitter/emetic compounds, and therefore reducing the utilisation of animal models by identifying the best candidates in a range of molecules. In this study a range of eight compounds were tested to investigate their effects on Dictyostelium random cell movement. The compounds list was specifically created to understand if the model system was able to predict the bitterness of those compounds and ultimately obtain a ranking order comparable to the in vivo rat brief access taste aversion (BATA) and human sensory panel models (Rudnitskaya, et al., 2013). The set of substances consisted of both organic and inorganic – azelastine, caffeine, chlorhexidine, potassium nitrate, paracetamol, quinine and sumatriptan. Results have shown that the bitterness ranking order obtained by using random cell movement assays was comparable to the one obtained with the BATA and the human sensory panel models. In particular, amongst those compounds, Azelastine, a selective (non-sedating) H1 antagonist structurally similar to other anti-histaminic molecules has shown to be one of the most potent compounds in the inhibition of Dictyostelium cell behaviour. This bitter-tasting compound is pharmacologically classified as a 2gen antihistamine, with relative lack of CNS (central nervous system) activity. Clinical trials, in vitro and in vivo studies have shown the combined effect of direct inhibition and stabilisation of inflammatory cells. In vitro studies suggest that the affinity of azelastine for H1 receptors is several times higher than that of chlorpheniramine, a 1gen H1 antagonist. Azelastine directly antagonizes TNF-α, leukotrienes, endothelin-1, and platlet-activating factor. In vivo studies in a guinea pig model have demonstrated that both histamine-related and h-independent bronchoconstriction were inhibited by azelastine (Williams et al., 2010). The second most potent compound tested is Chlorhexidine (CHX), a broad spectrum antimicrobial agent, frequently used in dental-care to inhibit bacterial growth and in periodontal disease prophylaxis. It is classified as antibacterial, but it can also interfere with the proteolytic activity of some periodontal pathogens. This inhibitory effect is associated with its chelating properties (Trufello et al., 2014). One of the chemicals used as standard for bitterness measurements is Quinine, a natural occurring alkaloid with different medicinal properties, such as antipyretic, antimalarial, analgesic, and anti-inflammatory activities. Cells and spores were stored at -80 ºC, and every month an aliquot of the frozen stock was collected and placed on a Raoutella planticola bacterial lawn. After 3-4 days, plaques of growth were visible, which were then scraped and transferred into liquid dishes. Culture dishes were kept in absolute sterile conditions at the constant temperature of 21 ºC. Cells needed for experiments were transferred into shaking cultures (120 rpm/min) or washed off every 2 days. In order to make shaking cultures, cells were washed off the plate, transferred to a G0 media (Ax medium containing 100µ/ml Penicillin and 100µg/ml Streptomicin), and kept in the shaking incubator at 21 ºC and counted and or diluted every day. Cells were utilised for experiments after 2-3 days of shaking and flasks were kept for one week before replacing them with fresh cultures. The liquid content in flasks was 1/5 of the total flask volume, in order to maintain ideal growth conditions (oxygen and surface area), and they were be kept between 2 and 5 x 106. Dictyostelium development assays were performed in triplicate experiments. Cells were plated onto membranes at the concentration of 1 x 107 per membrane (in KK2), then the membranes were transferred onto millipore filters embedded with the selected drug. Cells were placed in small petri dishes (6 cm diameter) and kept at 22 ºC for 24 hours in humid environmental conditions. Development images were taken after 24 hours at different magnification resolutions (x2, x3.2, and x4 side at 45-degree angle). At least 1 x 107 cells were collected from fresh culture plate, and resuspendend in 200μl D. discodeum freezing medium (7% DMSO, Horse serum), and frozen to -80ºC using isopropanol freezing containers for two hours, then stored at -80 ºC in liquid nitrogen. To prepare D. discodeum cells (Ax2) for behaviour analysis experiments, cells were grown in shaking suspension in Axenic medium (Formedium Co. Ltd, Norfolk, UK) for at least 48hrs. Cells were washed and resuspended in phosphate buffer at 1.7 x 106 cells/ml. Cells were then pulsed for 5 hours with 30 nM cAMP at 6 min intervals whilst shaking at 120 rpm. Cells were then washed in phosphate buffer, resuspended at 1.7×105 cells/ml, and 250 µL aliquots of cells were added to into a Lab-Tek 8-well chambered coverglass wells (Thermo Fisher, Leicestershire, UK), and allowed to adhere for 10-15 min, and for each experiment double concentrated drugs (250 µl) were administrated at the 15th frame by using a P1000. Cells movement was investigated using an Olympus IX71 microscope at 40X magnification, and images were recorded with a QImaging RetigaExi Fast1394 digital camera. Images were acquired every 15 seconds over a 15 min period for each compound, and at each concentration, with a minimum of three independent experiments for each drug/concentration and an average cell number of 10 cells quantified per experiment. Solvent only controls were carried out for all experiments to ensure readouts were based upon compounds listed, with for example, no effect of DMSO shown at 1% – the highest concentration used in the experiments described here. Ayana Wiener; Marina Shudler; Anat Levit; Masha Y. Niv. BitterDB: a database of bitter compounds. Nucleic Acids Res 2012, 40(Database issue):D413-419. Bachmanov AA, Beauchamp GK (2007). “Taste Receptor Genes”. Annual Review of Nutrition 27: 389–414. Choi, D.H. et al., 2013. Evaluation of taste-masking effects of pharmaceutical sweeteners with an electronic tongue system. Drug development and industrial pharmacy, 9045, pp.1–10. Available at: http://www.ncbi.nlm.nih.gov/pubmed/23786206 [Accessed October 10, 2013]. Finger, T.E. & Kinnamon, S.C., 2011. Taste isn’t just for taste buds anymore. F1000 biology reports, 3(September), p.20. Available at: http://www.pubmedcentral.nih.gov/articlerender.fcgi?artid=3169900&tool=pmcentrez&rendertype=abstract [Accessed December 9, 2013]. Margolskee, R.F., 2002. Molecular mechanisms of bitter and sweet taste transduction. The Journal of biological chemistry, 277(1), pp.1–4. Available at: http://www.ncbi.nlm.nih.gov/pubmed/11696554 [Accessed December 4, 2013]. Meyerhof, W. et al., 2010. The molecular receptive ranges of human TAS2R bitter taste receptors. Chemical senses, 35(2), pp.157–70. Available at: http://www.ncbi.nlm.nih.gov/pubmed/20022913 [Accessed October 17, 2013]. Pulkkinen, V. et al., 2012. The bitter taste receptor (TAS2R) agonists denatonium and chloroquine display distinct patterns of relaxation of the guinea pig trachea. American journal of physiology. Lung cellular and molecular physiology, 303(11), pp.L956–66. Available at: http://www.ncbi.nlm.nih.gov/pubmed/22962016 [Accessed September 19, 2013]. Robery, S. et al., 2011. Investigating the effect of emetic compounds on chemotaxis in Dictyostelium identifies a non-sentient model for bitter and hot tastant research. PloS one, 6(9), p.e24439. Available at: http://www.pubmedcentral.nih.gov/articlerender.fcgi?artid=3169598&tool=pmcentrez&rendertype=abstract [Accessed October 10, 2013]. Rudnitskaya, A. et al., 2013. Assessment of bitter taste of pharmaceuticals with multisensor system employing 3 way PLS regression. Analytica chimica acta, 770, pp.45–52. Available at: http://www.ncbi.nlm.nih.gov/pubmed/23498685 [Accessed October 10, 2013]. Ueda, T. et al., 2003. Functional interaction between T2R taste receptors and G-protein alpha subunits expressed in taste receptor cells. The Journal of neuroscienceâ€¯: the official journal of the Society for Neuroscience, 23(19), pp.7376–80. Wiener, A. et al., 2012. BitterDB: a database of bitter compounds. Nucleic acids research, 40(Database issue), pp.D413–9. Available at: http://www.pubmedcentral.nih.gov/articlerender.fcgi?artid=3245057&tool=pmcentrez&rendertype=abstract [Accessed October 17, 2013]. Williams, P.B., Crandall, E. & Sheppard, J.D., 2010. Azelastine hydrochloride, a dual-acting anti-inflammatory ophthalmic solution, for treatment of allergic conjunctivitis. Clinical Ophthalmology, p.993. Available at: http://www.dovepress.com/azelastine-hydrochloride-a-dual-acting-anti-inflammatory-ophthalmic-so-peer-reviewed-article-OPTH [Accessed February 3, 2014]. Available at: http://www.pubmedcentral.nih.gov/articlerender.fcgi?artid=3589262&tool=pmcentrez&rendertype=abstract [Accessed October 15, 2013]. Trufello, a M. et al., 2014. Subclinical concentrations of chlorhexidine inhibit gelatinase activity of carious dentine in vitro. Australian dental journal, pp.1–6. Available at: http://www.ncbi.nlm.nih.gov/pubmed/24494744 [Accessed February 10, 2014]. "Dictyostelium as a Predictive Model for Bitter Tastant." UKEssays.com. 11 2018. All Answers Ltd. 04 2019 <https://www.ukessays.com/essays/biology/dictyostelium-predictive-model-bitter-2183.php?vref=1>. "Dictyostelium as a Predictive Model for Bitter Tastant." All Answers Ltd. ukessays.com, November 2018. Web. 23 April 2019. <https://www.ukessays.com/essays/biology/dictyostelium-predictive-model-bitter-2183.php?vref=1>. UKEssays. November 2018. Dictyostelium as a Predictive Model for Bitter Tastant. [online]. Available from: https://www.ukessays.com/essays/biology/dictyostelium-predictive-model-bitter-2183.php?vref=1 [Accessed 23 April 2019]. UKEssays. Dictyostelium as a Predictive Model for Bitter Tastant [Internet]. November 2018. [Accessed 23 April 2019]; Available from: https://www.ukessays.com/essays/biology/dictyostelium-predictive-model-bitter-2183.php?vref=1.